Celebrate seasonal ingredients and exotic flavours with "Fresh + Easy", the third book in our new format Marie Claire series. Whether you are planning an easy dinner with friends or indulging in a casual brunch, spice it up with zucchini and lemon frittata, orange flower madeleines and creamy chai brulee. Or invite a friend to laze under a cool willow and enjoy the tang of lime parfait or ruby grapefruit sorbet. Whatever your taste or mood, "Fresh + Easy" features over 100 easy-to-prepare dishes that will gratify your senses, nourish your body and make every meal an occasion. 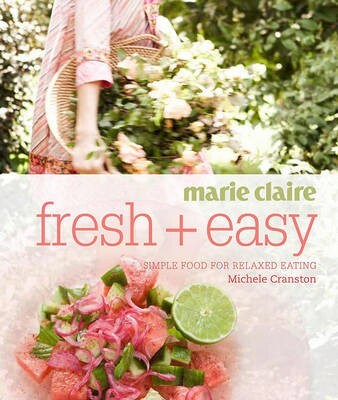 Written by author and chef Michele Cranston and accompanied by stunning garden photography, "Fresh + Easy" perfectly captures the light, carefree and healthy lifestyle embodied by the Marie Claire brand. This is the third in a new format series that follows on from "Real + Simple" and "Fresh + Fast". It features 110 light and healthy recipes inspired by global flavours. Recipes are clear, short and easy-to-follow - perfect for the novice as well as the experienced cook. It includes recipes for all occasions, from soups and casual meals to elegant mains and luscious desserts. Stunning garden and rural photography captures the light, fresh and healthy lifestyle that is embodied by the Marie Claire brand.